I know it’s September and we’re almost at the Autumn Equinox, but technically it is still summer. I’m holding onto that thought until 21:02 this Friday, the 22nd, when I finally have to let go of summer. It’s been a rich summer season, busy with work, school and holiday time. I’ve chosen few highlights to reflect on over the last few days until autumn sets in. This first highlight is probably a bit cheeky because I’m looking back into late May. But, hey, I’m calling it summer because the weather was beautiful and the air was ripe with the possibilities of long light days and mild nights. I had always wanted to head to Spring Fling, one of Scotland’s most successful and long-running art and craft Open Studios event, but I had never managed it. This year, my dear artist friend, Veronica, and I headed to Dumfries, and settled into some digs in a very colourful bed and breakfast that featured a giant Easter Island head in the back garden (but that’s another story…). On Saturday, we opted for the official Spring Fling tour minibus along the Green route into the northern section of rural Dumfries and Galloway. For eight hours, our wonderful volunteer driver took us through narrow country lanes, past ancient cottages and churches, visiting artists and makers in the villages of Durisdeer, Thornhill and Moniaive, among others. We took tea in artists’ stunning gardens, ate handmade cakes and spoke with many hospitable and talented people. What struck me was how often artists live near each other, making creative communities in quiet country corners. 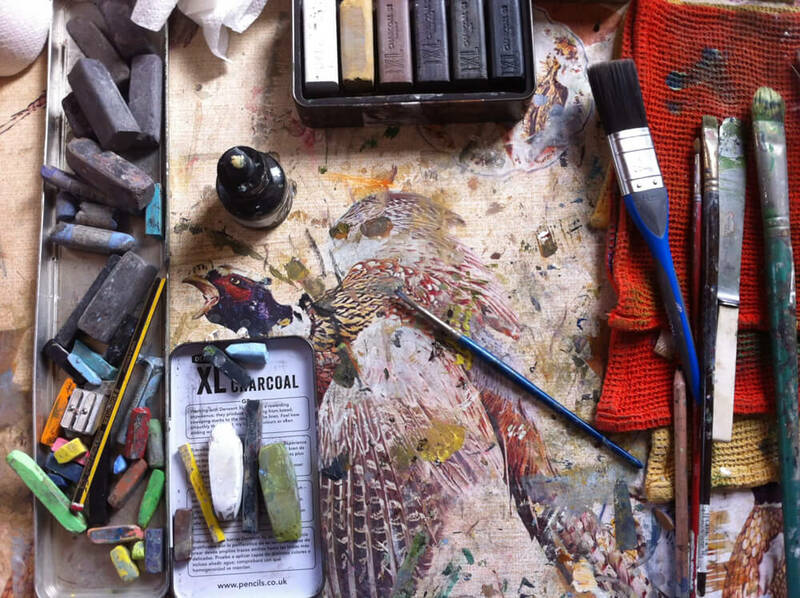 One of my favourite studios belongs to painter Anne Butler, whose art materials are in the photo above. Not only has she built her own gallery as part of her charming cottage, but she’s got a turf labyrinth in her garden! Please do check out her website. On Sunday, the magical minibus headed east on the Red route to Lockerbie, Annan and Langholm. This was another epic trip over highways and by-ways, visiting many artists exhibiting in town halls, tiny galleries and even old theatres. The most remote location was the Art Hut at Hightae, Minette Bell MacDonald‘s lofty studio overlooking the lush landscape. I sneaked a photo of her art materials but you should have a look at her website to see her artworks. Minette Bell MacDonald’s art materials at the Art Hut. What is this obsession with art materials, you might ask? There is something fascinating to me about artists’ tools and materials. 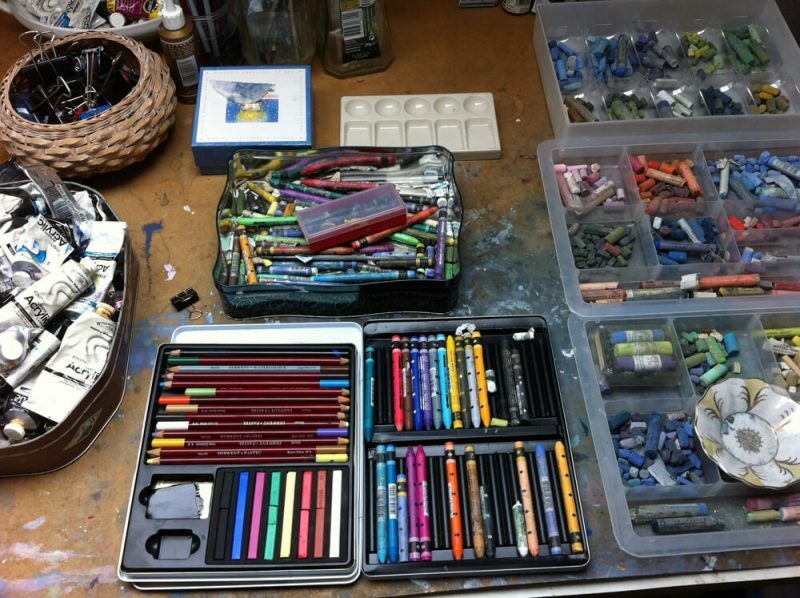 I like the order (or lack of it), the mix of pigments, brushes, chalks and pencils. Half-used materials hint at works that have been made and gone. By some alchemy, that charcoal stump has transformed into the elegant drawing on the wall. Magical! Veronica and I were pretty tired by the end of Sunday’s ramble but we had one mission left: to see my friend Deborah Campbell and her work at Bankend Studio, a gorgeous, rustic gallery space in an old byre in the village of Kirkgunzeon. It was well worth the extra trip off piste! 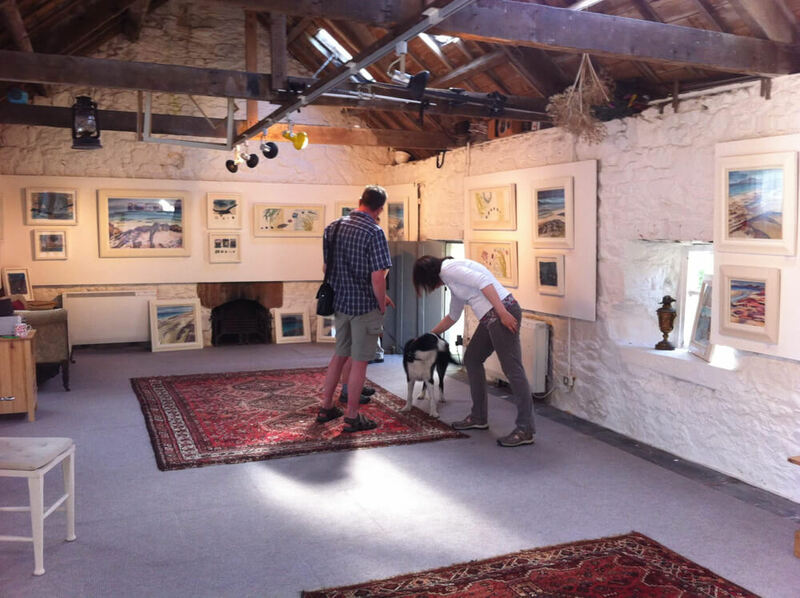 The space and garden were stunning – a perfect place for Deborah’s seascapes, linocut prints, textiles and mixed media pieces based on her painting trips to Iona and Tiree among other cool locations in Scotland. Check out her work here. Deborah greets a couple of friends at Bankend Studio, Kirkgunzeon.